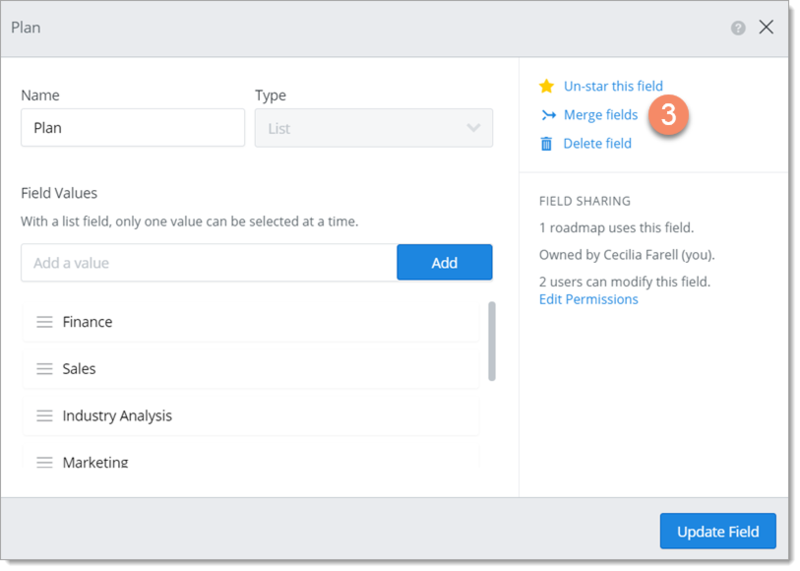 You can merge two field in your Roadmunk account to get rid of duplicate fields or to merge a roadmap-specific field into a Starred field. 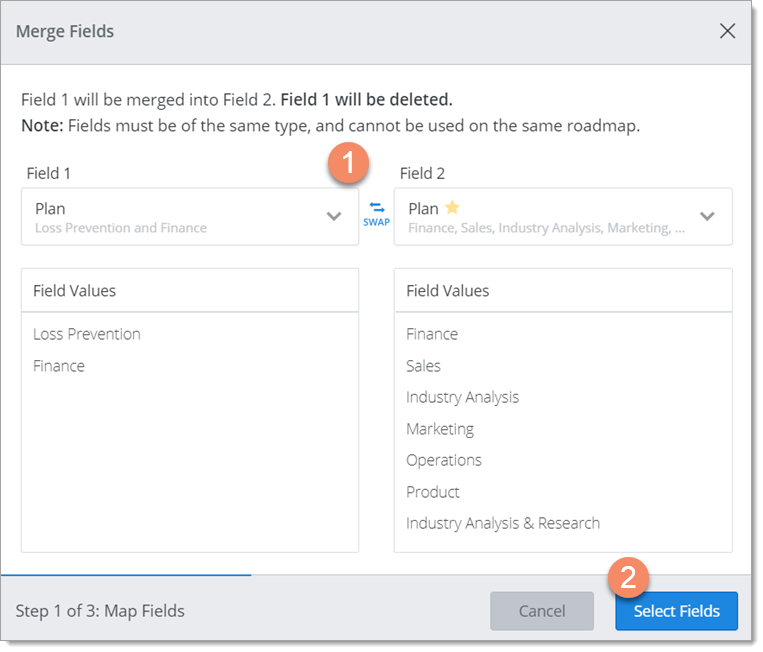 For some background on why you would want to merge fields, go to Items, fields and views in the Quick Guide and Create and add fields to a roadmap in this collection. When you merge fields, you merge a source field (Field 1) into a destination field (Field 2). When the merge is complete, Field 1 is deleted and Field 2 replaces Field 1 in all roadmaps that were using it. Depending on how you do the mappings for the merge, the values in Field 1 are retained, replaced, deleted, or added in the resulting Field 2. You can start merging fields by opening either field in the field card. Just make sure the fields are the same type and not in the same roadmap. 3. In the item card, click Merge fields. 1. 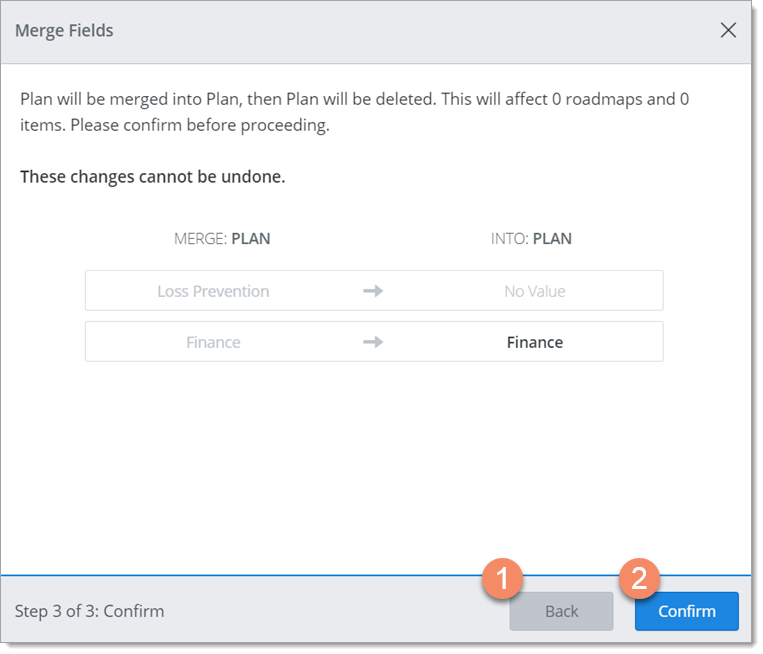 In the Merge Fields dialog, select the field you're merging from in the Field 1 dropdown and the field you're merging to in the Field 2 dropdown. You'll see each field's list of Field Values below. TIP: Use the Swap icon to quickly switch the field selections. In Step 2 of the merge, you map the values in Field 1 to values in Field 2. Roadmunk takes a best guess at the mappings but you can override any of them by changing the Field 2 selection. To keep Field 1 values unchanged: If Field 1 and Field 2 values are exactly the same, leave the mapping as is since no change needs to be made in the resulting Field 2 to keep the Field 1 value. After the merge, no changes are made to affected roadmap items either. To replace Field 1 values: If Roadmunk doesn't find a match, or even if it does, you can manually map a Field 1 value to a value in Field 2 that you think is a correct match by selecting it in the Field 2 dropdown. After the merge, the Field 1 value is replaced by the selected value in the resulting Field 2's values list and in affected roadmap items. To discard Field 1 values: If Roadmunk doesn't find a match for a value in Field 1, it automatically selects (No Value) in the Field 2 dropdown. Leave the mapping as is if you do NOT want to add the Field 1 value to the resulting Field 2. 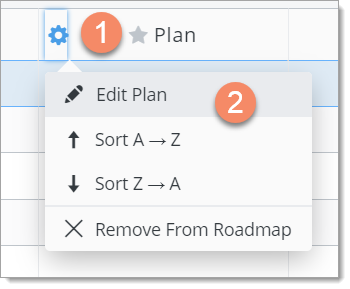 After the merge, Field 1 values in affected roadmap items will be deleted and the field left blank (No Value). To add Field 1 values: If Roadmunk doesn't find a match as above, select Add as a Field Value in the Field 2 dropdown to add the Field 1 value to the resulting Field 2's values list. Since no roadmap items are affected by the mapping, there is no change to any roadmap data. so it gets added to Field 2 and no data is lost. If there is matching value but Roadmunk couldn't find it, select it in the Field 2 value's dropdown. TIP: If you need to change something in the previous step, click the Back button. 1. 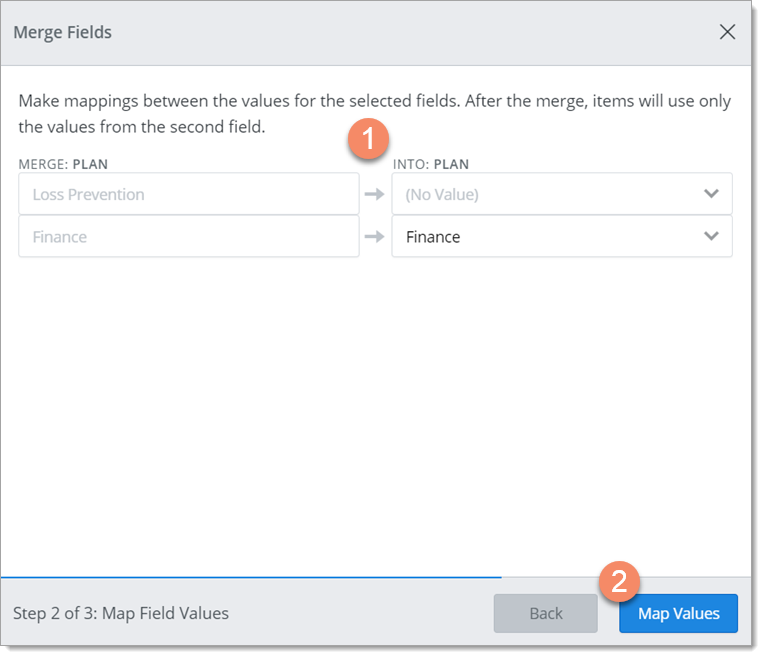 In the Merge Fields dialog, make sure field values are mapped correctly. If not, click the Back button and re-do the mappings. WARNING: Once you click Confirm, the changes can't be undone. 3. In the confirmation dialog, click Finish. To merge more fields, click Merge Another. To merge a Field 1 into a Field 2, you must at a minimum be the Owner or an Editor of Field 1. Whether you need similar permissions to Field 2 depends on the outcome of the merge. To do a merge that results in Field 1 values left unchanged, replaced or deleted, you only need to be the Owner or an Editor of Field 1. To do a merge that results in Field 1 values being added to the resulting Field 2, you must be the Owner or an Editor of Field 2 as well as Field 1.